Willie McCovey joined Giants teammate Willie Mays to give opposing pitchers the willies. McCovey smashed 30 or more home runs seven times, leading the NL in dingers three times, in home run percentage five times, and in RBI twice. 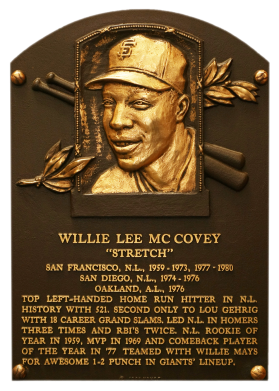 In 1969, "Stretch" was NL MVP with a .320 average, 45 homers, and 126 RBI. 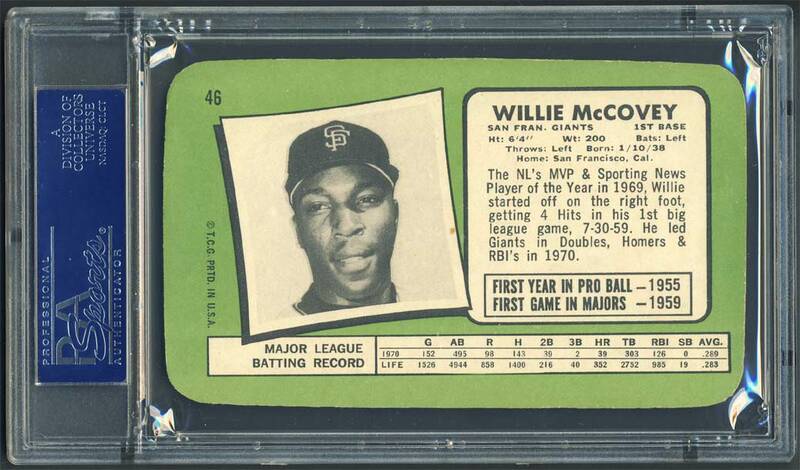 In 1970, McCovey homered in all 12 parks, a rare feat. "Big Mac" notched 521 homers, 1,555 RBI, 1,299 runs scored, and 1,350 walks in his career. Comments: Willie McCovey was one of the first portrait cards I purchased for the collection in the mid to late 1990s. 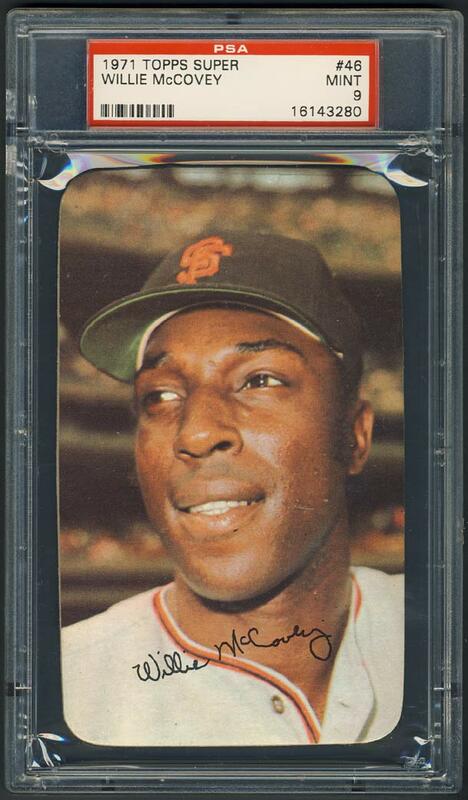 I chose a 1967 Topps PSA 8 and sold the card in April, 1999 after deciding to go with a 1964 Topps issue instead. In January, 2007 I replaced the 1964 Topps with a 1971 Topps Super PSA 8. Afterwards, I purchased a couple raw examples hoping to score a Mint rating but had no luck when I submitted them to PSA. So, in November, 2009 I finally broke down and purchased a PSA 9 when an example appeared on eBay. 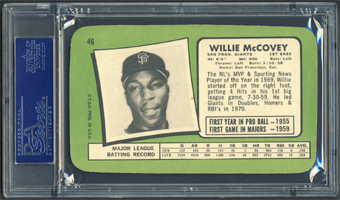 Description: Topps continued to produce its special oversized cards in 1971. The cards, measuring 3-1/8" X 5-1/4", carry a large color photograph with a facsimile autograph on the front. Backs are basically enlargements of the player's regular Topps ard. The set size was enlarged to 63 cards in 1971, so there are no short-printed cards as in 1970. Again, Topps included almost every major star who was active at the time, so the set of oversized cards with rounded corners remains an interesting source for those seeking the big names of the era.